Three-ingredient rosée pasta sauce | Fork off, heart disease! Good preparation goes a long way. We are quite lucky to have a full size freezer in our house, something that most Dutch households do not have. So we try to take full advantage of it by keeping a freezer stock of cooked grains and soaked nuts . I use quinoa and brown rice quite a lot so I usually keep a bag of those in our freezer. I also will soak a cup of sunflower seeds and cashew seeds and keep them in stock as well. Plus, when the soaked seeds thaw out, they tend to break up better in my bender. So the other night, I made another quickie pasta sauce that was similar to my bean sauce. This time, I used cashews, red pepper and some re-hydrated sundried tomatoes. Simple, quick and delish. This recipe should make enough for 4 servings, but if you like your pasta super saucy, then perhaps it would serve 2-3 people. First, pour some boiling water on the sundried tomatoes. Let them re-hydrate (keep the soaking water). In the meantime, prepare your pasta. Then, toss in your soaked cashews, along with the water, red pepper, re-hydrated tomatoes and veggie broth powder. Blend. If the sauce is too thick, add a bit of the soaking water to assist with the blending. 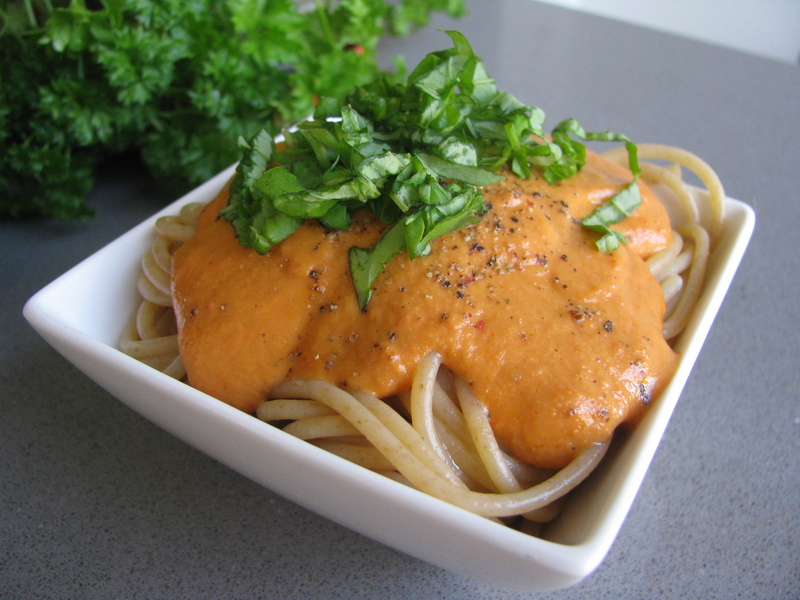 When everything is creamy (it should take a few minutes), toss in the sauce in a saucepan to heat it up. Serve with fresh basil and freshly cracked pepper. Added to this week’s menu plan! Not that I usually manage a weekly menu plan, but I’m giving it a go in an attempt to not have to go to the store almost every day. Yay! Thanks Dawn! Let me know how it turns out. It is such an easy recipe to throw together, especially when you get home hungry and you can´t be asked to whip up some elaborate dish.